Course materials — including homework, practice, tutorials and teacher handouts — are available for downloading from the Illiac Cloud. Connecting to the cloud is quick and easy, all you need is a computer with Harmonia installed and a network connection. On a computer with a network connection, start Harmonia. Click the Cloud button located in the top-left corner of the document's icon bar, or select Cloud▸Sign In from Harmonia's main menubar. Type your Illiac ID into the text box at the top of the dialog and your account password in the text box directly below that. Your Illiac ID is the email address that you registered with when you joined the course at illiacsoftware.com. Once you've provided your id and password, press the Harmonia Cloud Sign In button to sign into the cloud. Note that it may take a second or two to make the secure connection; you can tell that you have successfully connected if the Cloud icon turns blue. 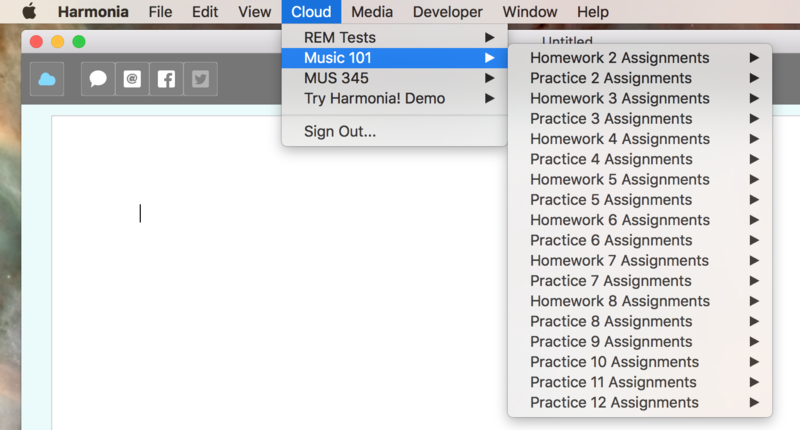 Once you make a connection your course materials will be available for downloading from the Cloud menu in Harmonia's main menubar. If the connection failed due to mistyped input in the dialog, the input will be highlighted in red. To fix the problem retype your Illiac ID and/or password and press the Sign In To Illiac Cloud button again to make the connection. Resolve the networking issue and then test it in your web browser by going to https://harmonia.illiacsoftware.com/ and attempting to sign in to your account. If you cannot connect to illiacsoftware.com then there is still a network problem or Illiac's server is down. If you can make the connection but cannot sign in to your account then there is an issue with your account. In this case contact your teacher for directions on how to resolve the issue. Once you can successfully connect to illiacsoftware.com in your browser you should start Harmonia again and sign in to the cloud. Reminder: if you start Harmonia and network problem already exists, fixing the network issue may still not enable a cloud connection inside the running Harmonia. The solution is always: (1) quit Harmonia, (2) fix the problem and verify that your browser can connect to your account at illiacsoftware, and (3) restart Harmonia to make the cloud connection.